Twenty years later, Mary Alice is still one of my best friends. I’m so thankful for her, yet at the same time, I realize I almost missed out. I almost missed the chance to have her positively impact my life. The problem wasn’t her beauty, but my insecurity toward her beauty. I compared my exterior life to her exterior life – which included a local network of family and friends that I envied – and fixated on the inequity. What I never considered at the party was how her soul might outshine her appearance. As impressive as she looked on the outside, maybe her interior was even prettier. Maybe we could be friends if I could look below the surface and get to know her as a person. I share this story because I think comparison can prevent, ruin, and hurt friendships. Comparison keeps us from truly loving each other and appreciating the unique strengths and blessings God grants to every individual. Until we admit this, until we realize how feeling inferior (or superior) to another girl doesn’t mean she needs to change, but rather we may have a heart issue that needs addressing, we’ll never have the relationships that allow us to genuinely cheer for other females and see ourselves on the same team. Wow, isn’t that the truth? Doesn’t it align with the fact that one of the most common struggles for males is PRIDE and one of the most common struggles for females is INSECURITY? Unfortunately, it starts early. You may notice signs on a playground when boys try to one-up each other to prove athletic dominance while girls gossip or make comments about other girls to make themselves look or feel better in comparison. I’m sure boys compare themselves too, but since my personal and professional life revolve around the world of girls, I can only speak for what I witness there. I’ve seen girls be completely confident one minute and lose all confidence the next as they look around and start comparing themselves. I’ve noticed that when a girl takes her eyes off her lane – even briefly – to sneak sideways glances at a peer, it can mess with her psyche and trigger self-doubt. It doesn’t matter how pretty, smart, talented, popular, or impressive a girl is either. She’s still likely to look around, see how she measures up, and stay keenly aware of the girl a few steps ahead of her in some important category. Comparison is never helpful. It makes us feel inferior or superior, less-than someone else or better-than them. God created us for more – to celebrate those ahead of us and help those behind us – and nobody needs to lose their race so we can win ours. Our lane is our own, and when we focus on what we were born to do while encouraging others in what they were born to do, we gain confidence and grow camaraderie. Little girls who compare themselves become big girls who compare themselves. We never outgrow the urge to rank ourselves or “master” emotions like jealousy. We can, however, keep our green monster under control. We can refuse to be blind to the good in others and not make snap assumptions like thinking someone’s exterior package looks too shiny – or not shiny enough. One of my most treasured friendships almost didn’t happen because I felt inadequate next to the prettiest girl in the room. I saw her as a potential threat, not a potential gift. I’ve shifted my thinking since then, and I hope to help others do the same. 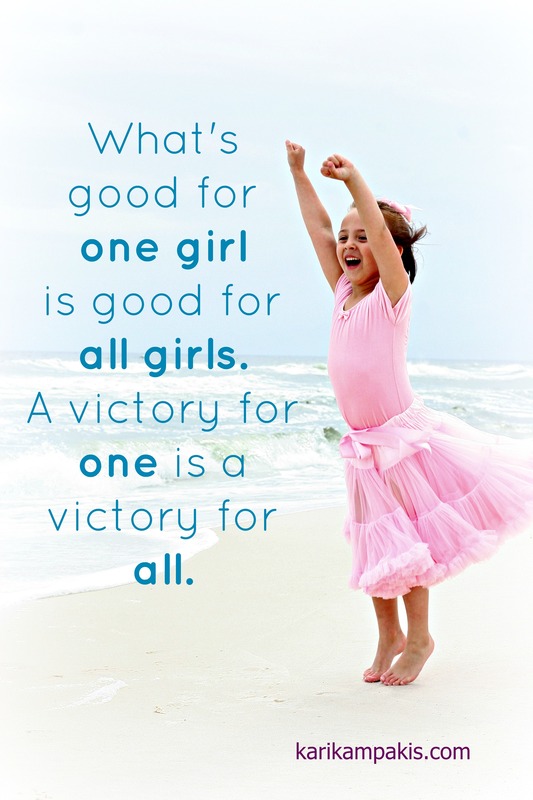 What is good for one girl is good for all girls. A victory for one is a victory for all. The world won’t teach this mentality, so it’s up to us, as moms and adults, to train our daughters to admire and appreciate each other’s gifts and blessings. To help them be confident enough in themselves – and God’s plan for them – that they can genuinely root for other girls. The starting point, of course, is modeling what we hope to see. Becoming the kind of woman who can handle an external inequity without having an internal come-apart. This is easier said than done, of course, but it’s worth our time and effort. On the other side of comparison, good things await all of us. And if we’re really lucky, we may be surprised to find an answer to a prayer. « Is Money Hurting Today’s Kids? Love this, Kari! Helpful perspective. Thank you for posting and challenging us all! 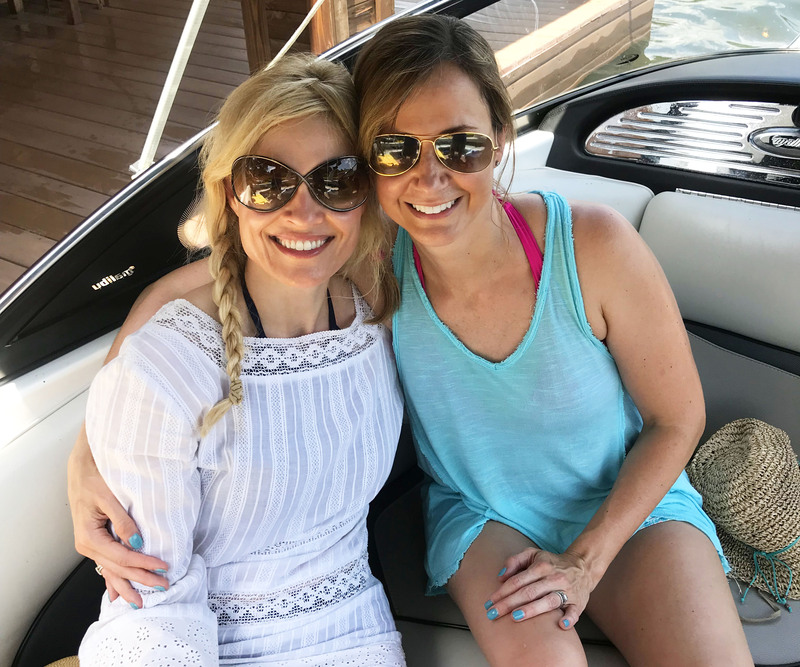 I’m a friend of Mary Alice’s, too, Kari and you’re right–she’s one of the prettiest women I know! But inwardly, she is far more beautiful. Always doing good, standing for what’s right. Thank you for your honesty in this post. I’ve done my share of comparing, too, and I know how it can make you miss out, or as you said it so well, it makes us see others “as a potential threat, instead of a potential gift.” Your post challenges me to look for potential gifts today. Thank you!